October 11, 2012 By This post may contain affiliate links. 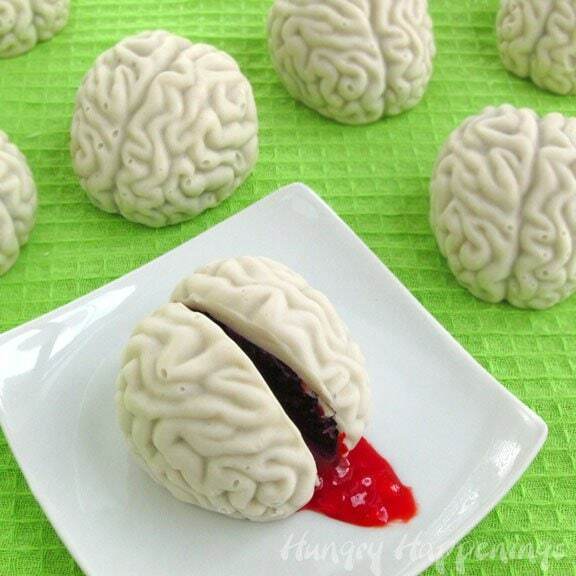 Make some Creepy Halloween Sweets this year and try these Cake Ball Brains with Oozing Cherry Blood! 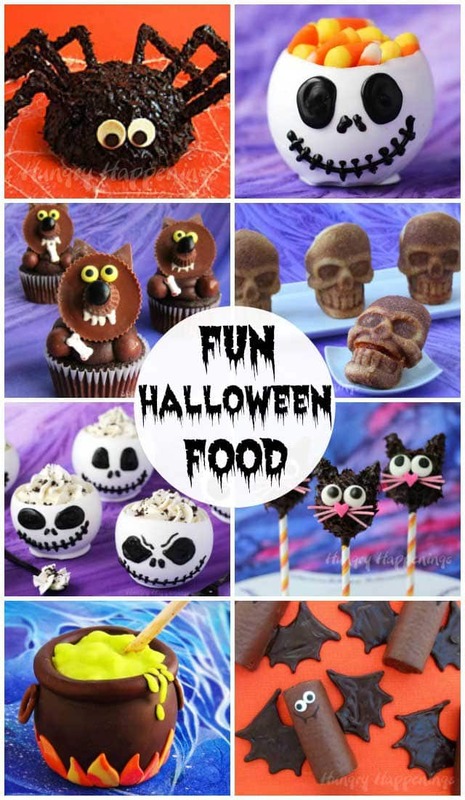 This fan favorite is absolutely to die for… they will be the talk of any Halloween party! There are only 9 days until my party and I have 80-100 guests coming. Can you hear my pulse racing? I have absolutely no time to ramble on today, so we’re just going right to the recipe for cake ball brains. I’m serving these at my party along with lots of other zombie themed sweets. *UPDATE: I made these and used about one once of candy melts per brains and about 2 tablespoons of the cake ball mixture, but I just had some friends over helping me get brains done for our party and after making 20 brains, had used all the white candy melts but had cake left over. Their candy coating was thicker than what I made. So by the end, they made 36 brains and used much more of the white candy melts. So, your quantities will depend a lot on your skill level using candy coating. I added more candy melts to the quantities just to be sure you have enough to make all your brains. **If you don’t have experience working with or melting white confectionery coating or candy melts, read my detailed Chocolate Making Tips page for instructions. Cut about 1/2″ all around the edge of the cake and just enjoy a snack. Break up the center of the cake into a mixing bowl or the bowl of a stand mixer (my preferred method**) or a food processor. Add 1/4 cup white frosting. Mix to combine. If the mixture holds together well and you can easily form balls, then stop, if it crumbles, add up to another 1/4 cup frosting. Set aside. **By using a stand mixer your cake balls will have a smooth truffle like consistency. If you do this by hand, you will probably want to mix it with your actual hands to get it smooth. If you’d like your brains to be gray, stir drops of black candy coloring into your melted white confectionery coating until you get the desired shade. I made mine a pale gray, but you could go much darker, if you prefer. Spoon some melted white candy coating into one of the brain mold cavities. Use a spoon or a pastry brush to paint the coating in a thin layer all around the inside of the mold. Be sure you can’t see any pink (the color of the mold) through the white. Paint all four brain cavities in your mold. Wipe off any candy coating around the edges of the mold. Freeze for 5 minutes. Don’t leave them in any longer or you may get cracks and condensation on your brains, and you wouldn’t want that now, would you? Remove the molds from the freezer. If you want your cherry filling to be brighter red, add a few drops of red food coloring. Spoon 3/4 teaspoon of the cherry filling into each brain cavity. Scoop out about 2 tablespoons of the cake ball mixture and press it into a brain cavity leaving enough room to add a layer of candy coating on top. Spoon some more white candy coating on top of each cake ball and smooth it out. Be sure to wipe off any excess coating around the edge of the mold. Freeze for 5 minutes. Remove the cake ball brains from freezer, turn mold upside down, press and pull on the mold until your brains pop out. Store the candy coated brains in an airtight container for up to a week. Just know that the longer they sit, the more likely it is that the cherry jam or sauce will soak into the cake. Thin sauces will soak in faster. If that happens, just serve them with a bit of extra sauce. I don’t recommend freezing or storing these in the refrigerator as the moisture in the fridge will cause beads of condensation on your cake ball brains. When the guests at my party bite into these cake ball brains, the cherry filling will ooze out and be quite a surprise. I can’t wait to see how everyone reacts. Let me know how your party guests enjoy eating brains! hahaah SUPER creepy! I don't know if I could eat it haha but I do appreciate the awesomeness of it! What a fun idea! My son would love this. I have a big brain jello mold. do yo think this would work in the big brain mold or would I need to have the smaller ones? It would work, just be sure to paint the chocolate onto the mold making sure you can't see through it. You don't want any spots where the cherry filling can leak through. Have fun making your cake and be sure to snap a picture and send it to me so I can share it! These are great!!! 🙂 I might do a Halloween treat roundup – could I link to these? That completely creeps me out, but I have to admit it's a genius idea. Good work. It's amazing 🙂 And it sounds delicious! Oh wow! I LOVE this!! I too have about 100 kids showing up for a party on the 27th!! I'll have to run around town tomorrow and see if I can find this mold. Wow,100 kids, you are a brave woman. We have about 30-35 kids. I have so much fun with them. We are playing outdoor games this year and know the kids will have a ball. 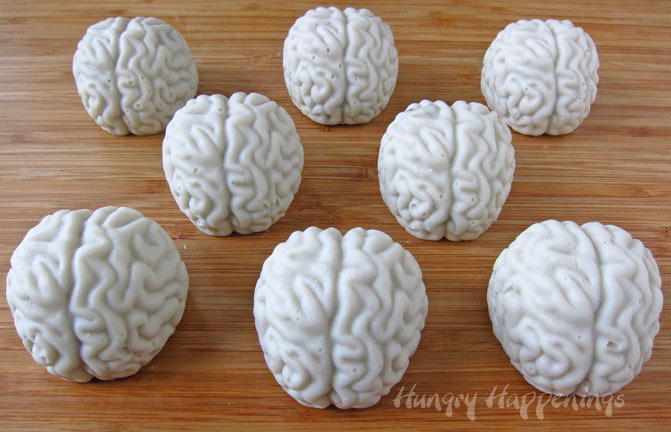 I found my brain molds on Amazon.com. I haven't seen them in any stores around here. I would suggest going to the Fred & Friends website to see if they have a list of stores they sell to before driving all over town. I hope you have fun making brains and have a great party. I have a foot mold and a hand mold but have not been able to find a brain mold. After seeing these I want…no…NEED a brain mold. I may have to start shopping on Amazon. :) These are sooooo cool! P.S. – Good luck with your party! Can't wait to see your spooktacular spread this year! I bought my brain molds from Amazon. I couldn't find them in any stores around here. I am so excited about our party. We baked and made chocolate all day today, but have so much more to do. These are soooo gross but in a GREAT way!! 🙂 Good luck with your party – I ca't wait to see all the pics!! What a fantastic idea! I've got jack-o-lantern molds, so I'm thinking of doing something similar. 🙂 Inspiration! Amazing! Love it – My grandson is going to love these, one day. Today it will be my husband! 🙂 Great job!! As I wrote it I couldn't help but laugh. I didn't mean for it to be funny, but it just is! awesome! i am also getting quite the collection of ice cube molds (and really never using them for ice!) my kids would love these bloody brains! Thanks. I know what you mean, I haven't used any of my molds for ice either. Maybe I'll actually make some ice cube brains for our party, if I find the time. Thanks, Sondra. I'm sure you'll have fun making your brains and watching as people eat them. Some of my friends where here yesterday baking for our party and they really got a huge kick out of the brains. Those turned out so well! Very awesome! Absolutely, as a matter of fact we have made the cake ball brains plus some filled with caramel and marshmallow and even some filled with peanut butter fudge. They all work great.